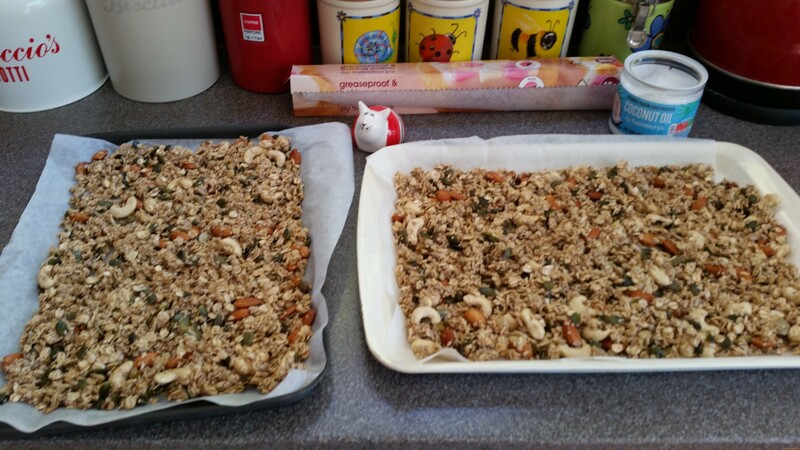 I have been meaning to make my own granola for absolutely AGES. In case you don’t know what it granola is a mixture of toasted rolled oats with the addition of seeds, nuts and dried fruit. It’s very healthy and it tastes delicious sprinkled on yoghurt. I knew it would be a straightforward affair but I kept putting it off. No more! I finally made a big batch of it. Yippee! And the home made variety is so much nicer (and cheaper) than the bought one. I put lots of nuts and seeds in mine as that’s how I like it. On the other hand I refrained from adding dried fruit or dessicated coconut, which you find in some recipes. There are many variations out there. I kind of combined several recipes I saw on the net to produce something simple but wholesome. Enjoy!! Heat oven to 150C/fan 130C/gas 2. Mix the honey and coconut oil in a large bowl. Tip in all the remaining ingredients and mix well. Tip the granola onto two baking sheets and spread evenly. Bake for approx. 35 minutes. 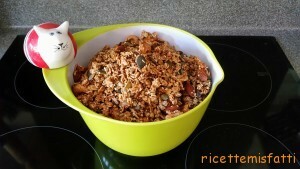 The granola can be stored in an airtight container for up to a month.